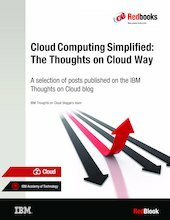 This IBM® RedBlook™ publication is a collection of selected posts published on the IBM Thoughts on Cloud blog. Thoughts on Cloud is IBM’s official cloud blog, contributed by hundreds of cloud computing specialists worldwide from IBM and IBM Business Partners. Most of the authors have hands-on experience implementing cloud solutions for various industries. The goal of the blog is to provide readers with a forum to discuss and debate various cloud computing topics. Starting with the basic building blocks of cloud computing, we cover a wide range of cloud topics in this book. We do not go into details of specific cloud products on the market, so this book serves as a cloud primer for readers who are new to this exciting technology. If you are already familiar with the fundamentals of cloud computing and would like to explore more advanced cloud topics, you can still benefit from this book. Each section is independent of the others, so it is OK to skip the sections you are familiar with and go directly to the section you’d like to read first. What lies ahead for the future of cloud?